Join us for Art and Art History Associate Professor Annika Marie's talk! Due to the forecast of extreme cold and wind-chill conditions, Columbia will close at 6 p.m. on Tuesday, January 29, and remain closed on Wednesday, January 30. The lecture (originally scheduled for Wednesday, January 30), has been rescheduled for Wednesday, February 20, 2019. Annika Marie is Associate Professor of Art History in the Art and Art History Department at Columbia College Chicago. She received her BA in art history from Mills College (Oakland, Calif.), her MA in art history from Columbia University in New York City, and her PhD in art history from the University of Texas, Austin. Her areas of research and teaching focus are modern and contemporary art history, theory, and criticism. A former Marie Walsh Sharpe Fine Arts Scholar and former Core Critical Studies Fellow of the Core Program of the Glassell School of the Museum of Fine Arts in Houston, Texas, Marie has engaged the contemporary art world through art criticism and curatorial projects. She has written on Allan Sekula, David Bunn, and Andrea Zittel, among others, for publications such as Art issues and Xtra. 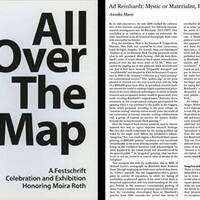 In 2009, she co-curated with Michelle Grabner, Picturing the Studio, an exhibition for the Sullivan Galleries of the School of the Art Institute of Chicago; in 2010, organized a “performance” Festschrift for Moira Roth on the occasion of Roth’s 77th birthday that was hosted at The Poor Farm, an arts residency in Manawa, Wisconsin. Her scholarly publications include “Action Painting Fourfold: Harold Rosenberg and an Arena in Which to Act,” in The Studio Reader: On the Space of Artists (University of Chicago Press, 2010); and “Ad Reinhardt: Mystic or Materialist? Priest or Proletarian?,” in The Art Bulletin (December 2014).